We are happy to introduce you to the Hancock Dental Center team! 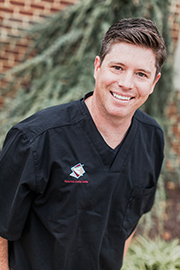 Dr. Josh and his team always provide a gentle, caring, and compassionate approach to dental health. You will truly appreciate our exceptional care and how our team makes you feel like family! In 2003, Dr. Joshua Hancock established Hancock Dental Center in his hometown of Martinsburg, WV. A graduate of Martinsburg High School, Dr. Josh (as he’s better known to his patients) continued his education at West Virginia University (Let’s go Mountaineers!) completing his Bachelor of Sciences degree and ultimately earning his Doctor of Dental Surgery degree in 1999. After graduation, Dr. Josh completed a hospital-based residency in general practice through the Veterans Health Administration Hospital in Hampton, Virginia. Treby leads an active lifestyle outside of the office. She loves spending time with her son and 3 dogs. Not a native of the area, Treby is still exploring and learning what West Virginia has to offer (often finding things that our local team members have overlooked!). She enjoys exercising, hiking, kayaking, and camping. Rachel grew up in nearby Gerrardstown, WV where she attended Musselman High School. She then went on to earn her Bachelor of Science degree in dental hygiene from West Virginia University in May 2012. Upon graduation, she returned to her hometown and joined the team at Hancock Dental Center. Outside of the office, Rachel loves spending time with her husband and son. They enjoy exploring the many parks and fun activities this area has to offer. They also cheer on the Mountaineers and travel to Morgantown for football games with friends and family in the fall! Sarah was born & raised in Hedgesville, WV & graduated from Hedgesville High School. She attended Allegany College of Maryland where she obtained her Associates of Applied Sciences degree in Dental Hygiene. Sarah has special interests in periodontally involved patients. When she isn’t at work, Sarah enjoys traveling and gardening and hiking, especially in the Shenandoah National Forest. She is a dog mom and a lover of all cats. Tia grew up in Inwood, WV and graduated from Musselman High School. She attended West Virginia University where she obtained a Bachelor of Science in Dental Hygiene degree. She was recognized as one of the top 3 students in her class while also receiving the Student Award for Clinical Competency and Professionalism. Tia has a passion for dentistry and patient care and has recently written an article on the subject for an online dentistry magazine. When not practicing dental hygiene, Tia enjoys spending time with her husband and two dogs. Her hobbies include crafting, traveling, and antique shopping. Sara is the friendly face (and voice) you’ll find at our front desk welcoming you to Hancock Dental Center! 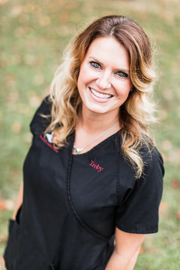 She grew up in Winchester, VA and was in the financial world for 9 years before making the switch to dentistry! She is our Patient Coordinator, and handles all insurance & billing duties. She prides herself on making our patients feel right at home when they are in our office. In her free time, Sara enjoys spending time with her husband & dogs, camping, traveling (mostly for the food), and doing “fixer upper” projects around the house!